Colorado has 58 mountain peaks exceeding 14,000 feet (known as "fourteeners" or "14ers" locally) — the most of any state. Outdoor enthusiasts of all skill levels will find peaks ranging from easy to very difficult, with hiking trails for exploring the state's scenery, wildlife and rugged beauty. Some of the Colorado's best-known fourteeners include the tallest, Mount Elbert; Pikes Peak, which inspired the poem "America the Beautiful"; and Longs Peak, which resides inside Rocky Mountain National Park. See a full list of 14ers and their elevations and an awesome infographic that describes what makes them so special to Coloradans. The reward for reaching the summit of one of these 14ers? Some of the most breathtaking views you'll find anywhere on the planet, as well as stargazing opportunities. But it's important to know a few things before you head out to these massive Colorado fourteeners. There is a debate about exactly how many 14ers there are in Colorado. The Colorado Geological Survey says there are 58 peaks that exceed 14,000 feet in elevation. Others use this logic: To qualify, a peak must rise at least 300 feet above the saddle that connects it to the nearest 14er peak (if another exists nearby). You can make up your own mind! 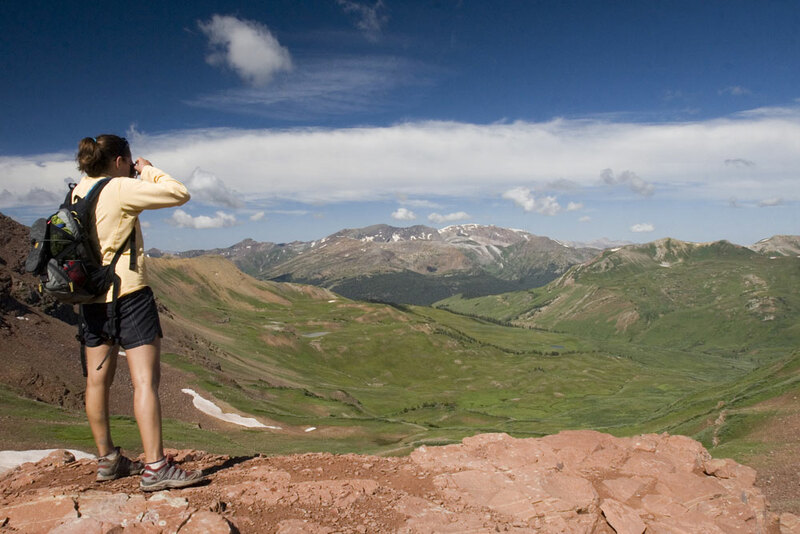 While climbing up a fourteener can lead you to breathtaking views, the thinner air can lead to altitude sickness. Altitude sickness is brought on by a lack of oxygen to your body and a failure to acclimate to air that has less oxygen. It can be caused by going too high, too fast. The problem is, everyone's body has a different rate of acclimating, so it's important to be aware of any changes you feel. The most widely felt symptom is a headache, but other symptoms include shortness of breath, tightness in the chest, marked fatigue and weakness. If you experience any of these, just follow the simple guidelines below and let others know you're not feeling 100 percent. Symptoms often improve once your body adapts to the higher elevation, but you need to be patient — and most importantly, keep hydrated and take it easy. • Most importantly: if you're not feeling well, let someone know. Colorado has the great fortune of having these 58 majestic fourteeners right in our backyard. But every year, an increasing number of hikers and climbers attempt to ascend one of these peaks, impacting the alpine environment. It is up to those who love these mountains to minimize damage to their fragile ecosystems. The Leave No Trace (LNT) program is dedicated to building awareness, appreciation, and most of all, respect for our public recreation places. It is not based on rules and regulations as much as attitude and awareness. • Rest on rocks, not on vegetation. • Leave what you find, including flowers and berries. • Pack out all food; don't throw it on the ground. • Conduct bathroom stops at least 200 feet from bodies of water. • Pack out toilet paper in plastic bags. • Stay on designated trails and don't cut across switchbacks. • Walk through puddles on the trail, not around them, to avoid creating wider or multiple trails. • Spread out when walking in areas where there is no trail. • Avoid loose rock debris covering a slope; use the most stable route. For more information on the fourteeners in Colorado, including a complete list, trip reports and more, visit 14ers.com and the Colorado Fourteeners Initiative. And read about other famous mountains in Colorado and Pikes Peak: Things to See & Do. Check out the Colorado Outdoor Adventure Blog for even more inspiration!